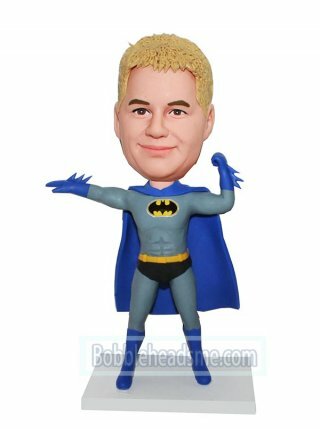 This custom male superhero bobblehead doll's costume is blue and black, and it comes with a cape! Here we can take a photo of any man you choose and cast him as a Superman. Put your favorite friend's face on him to see what happens. My boyfriend was the happiest man alive when I surprised him with the his bobble heads!!! All his friends are jealous!! !